In addition to offering topnotch Real Estate educational products, Dearborn offers turn-key solutions for launching and maintaining a real estate school. In an effort to provide the best support possible to our partners, we launched Dearborn Services as part of our continual transformation to stay top of the industry and ensure our partner’s success. 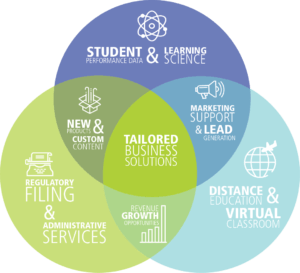 We are here to help you every step of the way with a variety of services to help your school succeed. REcampusLIVE: REcampusLIVE is a co-branded virtual classroom that allows you to conduct courses live online. Learn more about REcampusLIVE here. Regulatory Filing Services: Dearborn’s specialized team will help your school complete regulatory filing and administrative tasks. Custom Content: Dearborn’s custom content program is available to assist our partners in creating unique products to help differentiate themselves in the market. Interactive Study Group: To keep prelicensing distance education students engaged Dearborn hosts a live online weekly tutorial session which covers national key concepts that students should comprehend. This option is available to our REcampus partners who offer online prelicensing. RealXperts: Provide professional development to your students to help further their careers. This free webinar series features industry experts discussing hot topics in the real estate field.